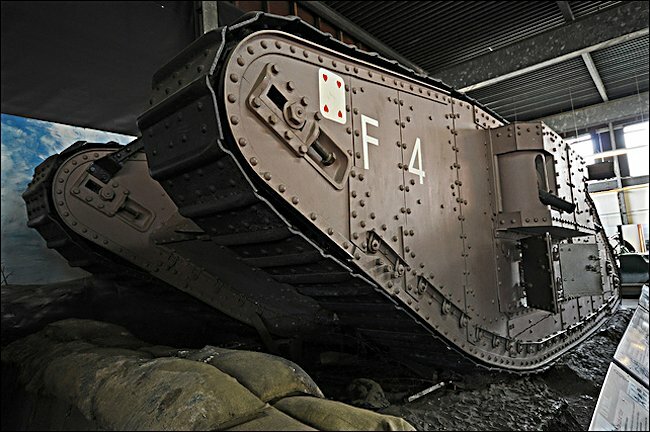 This very well preserved WW1 British Mark IV Female tank called "Daphne" can be found in Museum of Lincolnshire Life in Lincoln, England. It belongs to the Tank Museum in Bovington Dorset but it is permanently exhibited in Lincoln because it was at first thought to be a tank called "Flirt II" number 2179, that had been presented to Lincolnshire County Council after WW1 to be used as a War Memorial and also to honour Lincoln's role in the invention of this new type of war machine. The Lincolnshire Museum and Bovington Tank Museum for over thirty years believed that this tank was damaged and abandoned by its crew during an armoured attack on German trenches in France during WW1. The were under the impression that it had been captured by the Germans and paraded in the streets of Belgium for propaganda purposes. 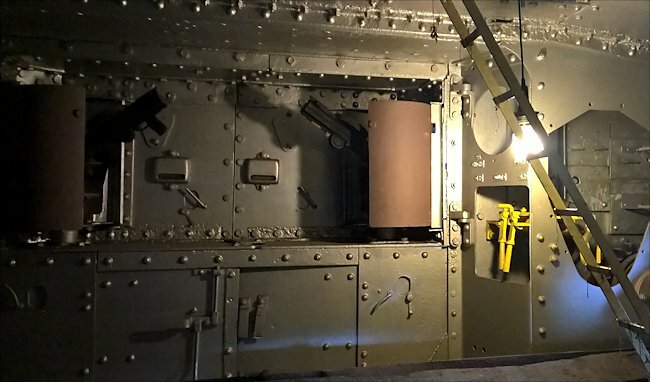 During the filming of inside the tank for the museum's new digital tour guides, a different serial number was discovered than the one that was expected. 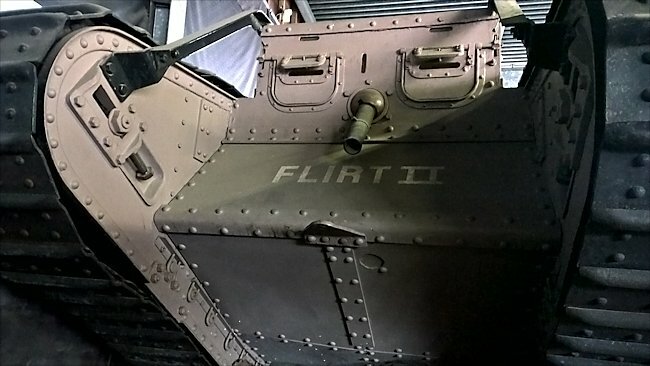 This lead to the discovery that in fact this tank was called "Daphne" and not "Flirt II". They were two completely different tanks. Research has shown that she was issued to the 12th Company, D Battalion of the Tank Corps. She was mentioned in regimental diaries as having been involved in the attacks at Passchendale in August 1917. 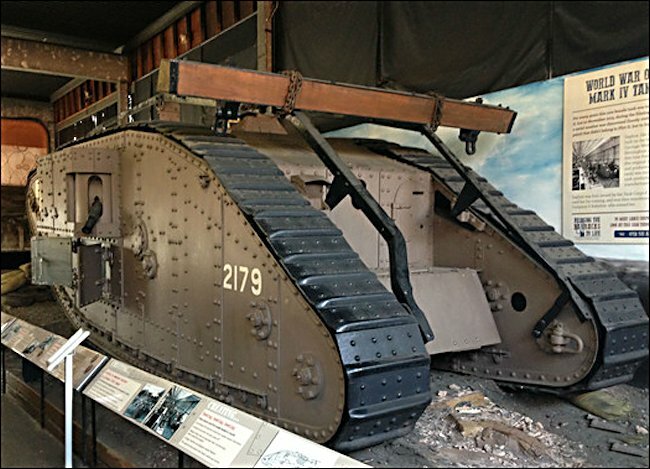 This WW1 British Mark IV Female Tank can be seen in the Museum of Lincolnshire Life in Lincoln. The wooden plank was used to help the tank get out of the mud. It was chained to the tracks and worked like snow chains. After the war "Daphne" was shipped back to England and given to the people of Gloucester as a "Presentation Tank" as a way of honouring the dead and saying thank you. This happened all over Britain. 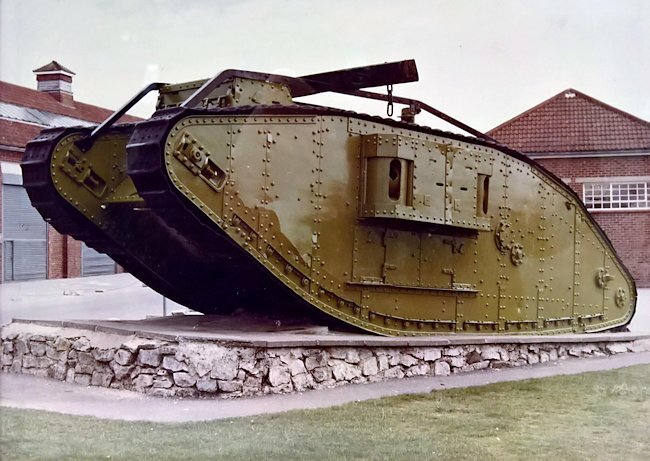 The Mark IV female tank in Ashford Kent is another example of a presentation tank. Unfortunately interest in the tanks of WW1 declined in the 1930's. Many were not maintained and were sold as scrap metal just before and during WW2. This WW1 British Mark IV Female Tank is still showing the name Flint II but it is in fact a tank called Daphne from 12th Company, 'D' Battalion of the Tank Corps not 'F' Battalion. Notice the forward facing Lewis Machine gun. The Tanks and their crews finally got the chance they had been waiting for on the 20th November 1917 when they assembled on mass for the now legendary Battle of Cambrai. A total of 476 Tanks were fielded for the first day of the battle and along with their supporting infantry they pushed the enemy further than anyone could ever have dreamed and back in England church bells were rung in celebration of the great victory of the Tanks. Regrettably the Battle of Cambrai was not the victory it had first appeared to be. At the end of the first day, 179 out of the original 476 machines had been lost, due to enemy fire, break downs or being ditched on unsuitable ground. The Tanks gains were not properly exploited by the supporting infantry and cavalry, a Tank is perfect for taking enemy positions, but is not very good for holding them. 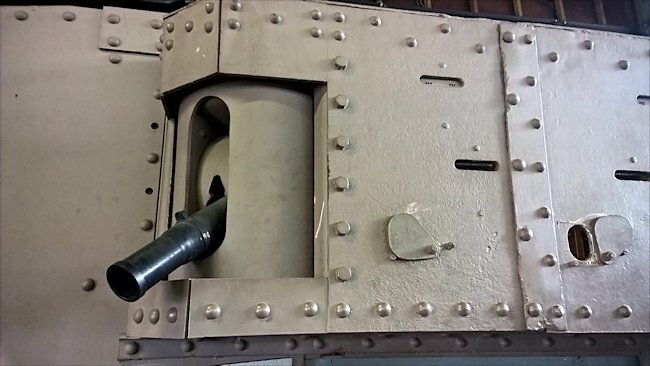 On this WW1 British Mark IV Female Tank you can see vision slots and oval pistol holes that had armoured swivel covers. When the inevitable German counter-attack came, they pushed the British right back again, almost back to where they had started from on the first day. This has been blamed on a number of factors such as poor leadership at General Headquarters or the fact that the cavalry failed to turn up as arranged. It is just as likely that the failure to exploit the gains was purely because nobody had expected the Tanks to advance as far as they did. Whatever the reason, the battle finally ended as a virtual draw in men lost and ground taken, but it had shown what could be achieved by a disciplined crew in the latest Mark IV on good ground. Now that the Generals were clear on just what a Tank could really do, their place in the British Army was never in question again. Due mainly to overoptimistic reports in the press, back on the Home Front the British public was completely unaware of the tactical shortcomings of The Battle of Cambrai. They feverishly embraced the Tank as their saviour, the industrial and scientific solution to the new technological war that they had been expecting since 1914. The men of the Tank Corps had always believed vehemently in the new weapon and knew that it could change the Allies fortunes if only it was given the chance it deserved, Cambrai was that chance and they had seized it with both hands. The Tanks played a pivotal part in many battles of the Great War and although badly mauled in the German push of March 1918, they fought back and helped secure final victory when the British pushed back at Amiens. The Allies 'Big Push' began on the 8th August 1918 and was famously described by the German General Ludendorff as 'the blackest day of the German army'. 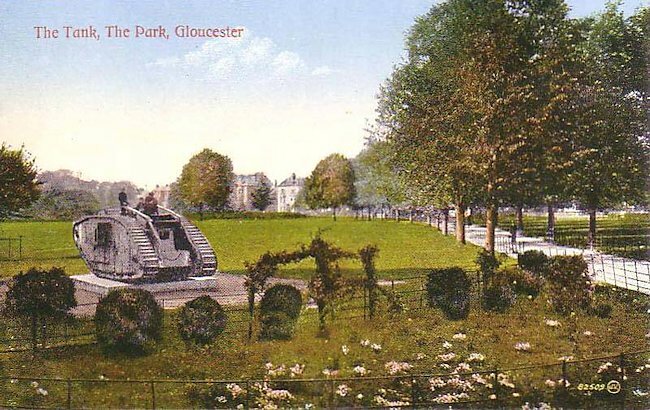 At the end of WW1 the Mark IV Female Tank now in Lincoln was given to the people of Gloucester as a presentation tank and mounted on a concrete block in main city park. This is a colorised photo that was produced as a post card for tourists. Where can I find other preserved Mark IV Tanks?